After exploring modern Arxanes, we decide to look into nearby archaeological sites uncovered during the past several decades. These might shed more light on the culture of ancient Arxanes, and help us understand why this palace was built so near Knossos. We have found that experts disagree about using the word “palace” to describe the great Minoan complexes, because this implies a king’s home. Some propose that, rather than serving as a royal residence, these complexes may have actually been built for religious purposes – worship, sacred ceremonies, community festivals, and such. Facts support this view. Long before the first palace was built, religious rituals were conducted in open air courtyards – and everyone in town attended. At some later time enclosed courts were constructed. This effectively restricted participation in certain rituals to a smaller group of people – perhaps a rising class of elite religious leaders. The enclosed court was expanded to include cult rooms (with altars for worship), reception halls, residential quarters (perhaps for chief priests and priestesses), workshops, support facilities, and a theatrical area outside the complex – where the common folk could gather for public events. The first palaces rose during the Middle Minoan period, around 2000 BCE, at about the same time writing, colorful wheel-made pottery, and other arts and inventions were introduced (maybe due to the influence of trade contacts with Egypt and the Near East). Arxanes was built during this period. What makes Arxanes unique? As we said in the previous report, the palace at Knossos appears to be sited for optimum viewing of the most important peak sanctuary in the Minoan world, the one at the top of Mt. Iouktas. Built at the foot of the sacred mountain, Arxanes has the only road leading directly to the peak sanctuary. This suggests Arxanes had a close connection to the sanctuary. Perhaps it was responsible for the upkeep and religious functions of the mountain temple. That would give the town enormous prestige throughout the land. The Mt. 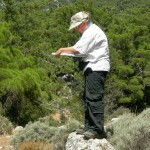 Iouktas sanctuary is larger and more complex than others. Near the junior high school, we find a road sign indicating “Ancient Fourni” and drive up. We don’t get far before we must park and climb a hill. The archaeological site is fenced, but we managed to get in through one of several large gaps. The local people called this hill Fourni because of a stone hut shaped like a baker’s oven (fournos). Farmers used it to store their tools. 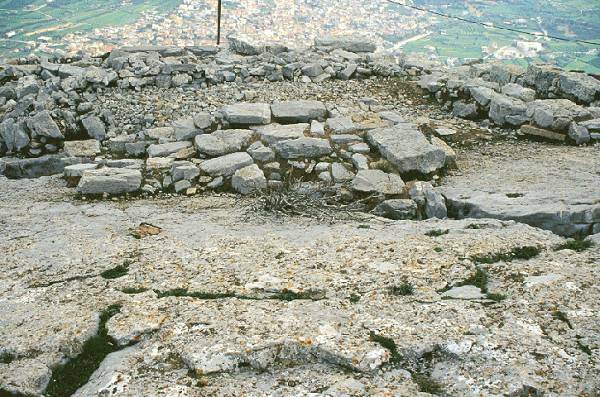 When the archaeologist Yiannis Sakellarakis climbed this hill in 1964, he instantly recognized this hut as a vaulted tholos tomb. What the farmers used as a door was a hole in the roof, made by ancient grave-robbers. Dirt falling through this hole had created a new floor several meters higher than the original one. After removing the rubble inside the tomb, it appeared the grave had indeed been looted. However, Sakellarakis noticed a structural oddity in the wall, which made him suspect there was a hidden chamber behind. 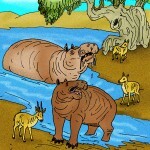 After carefully removing the stones, he found the head of a bull that had been sacrificed in honor of the dead person. Such bull sacrifices were major religious events in Minoan times. Sakellarakis found he had uncovered the first unlooted royal grave in Crete. The jewelry of gold and precious stones in that one grave was a bigger hoard than all the jewelry found in all the ancient graves in Crete put together! They also found ten bronze vessels of excellent quality, an ivory inlaid wooden chest, eight ceramic pots, and of course an earthenware larnax (see photo below) containing the royal dead person. 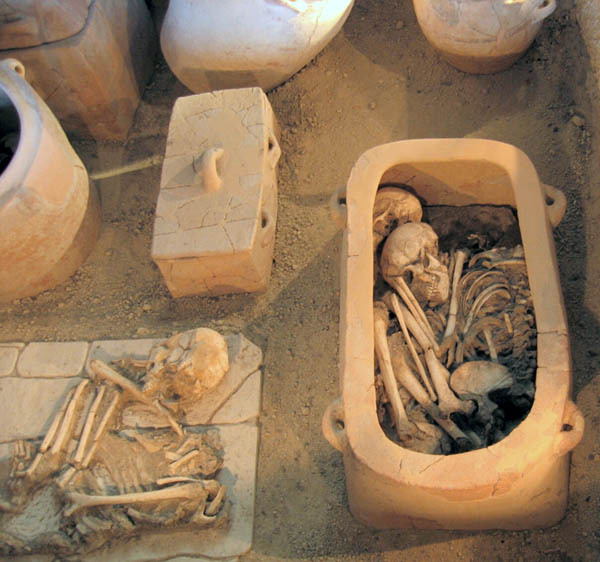 Most of this Minoan cemetery, which was used for more than 1400 years, has now been excavated. 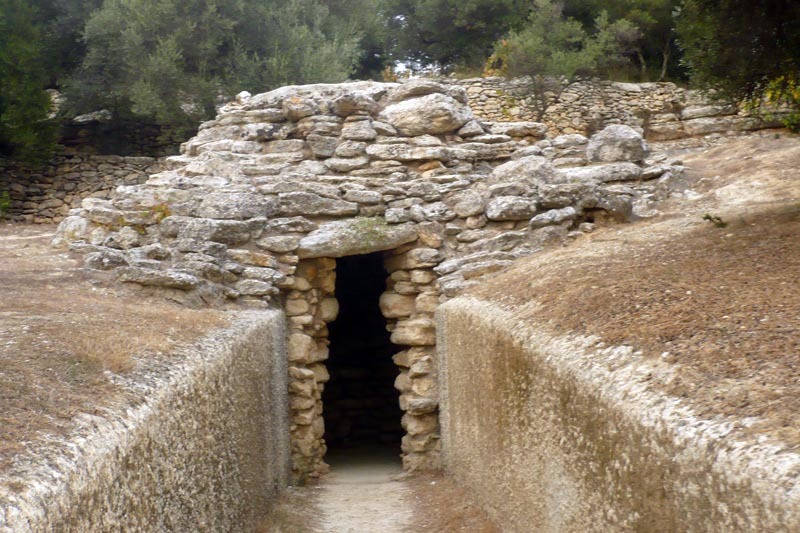 North of the unlooted royal burial chamber, is a Mycenaean burial enclosure with burial chambers containing rich funeral gifts (stone pots, seals, bronze vessels and decorative artifacts made of ivory). On the south side, Sakellarakis found another unlooted vaulted grave from 1350-1300 BCE, where a young woman was buried with all her jewelry, still holding her mirror. There are 26 buildings here, and numerous graves with rich funeral gifts that exhibit the high cultural and living standards of Arxanes. After returning to our car, we drive to another important site excavated by Sakellarakis – the Temple of Anemospilia at the base of Mt. Iouktas. 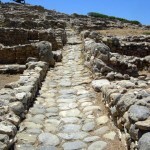 This temple is probably the most controversial Minoan discovery ever. 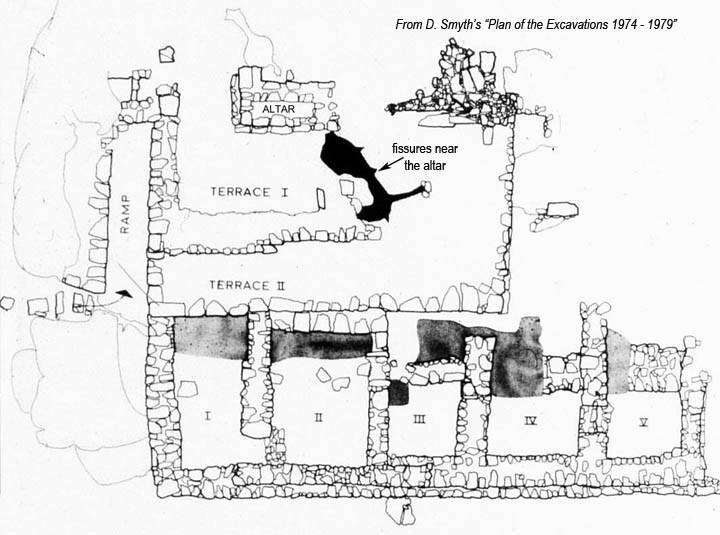 Yiannis and Efi Sakellarakis began excavations in the summer of 1979 and uncovered a rectangular building with four rooms (three side-by-side and one ante-chamber in front). In this ante-chamber, excavations uncovered 150 pots and the skeleton of a man who died when the temple collapsed during an earthquake. Next to the man was the pot he had been carrying (broken), a typical ceremonial pot which Minoan priests used in their bull sacrifices to collect the blood of the sacrificial animal. The two archaeologists thought they would find the bones of the bull being sacrificed at the time of the earthquake. They were amazed when they unearthed human skeletons near the temple altar. One was a man wearing valuable jewelry, and next to him was the skeleton of a woman. In the center of the room, on a stone altar, was the skeleton of a young man, lying in a position indicating he was tied-up, with a big ceremonial knife stuck in his stomach. These findings suggest a case of human sacrifice, by which the priests were trying to appease the deity who had inflicted seismic tremors on their island. It didn’t work. When the main earthquake arrived it destroyed all the palace centers of Crete. 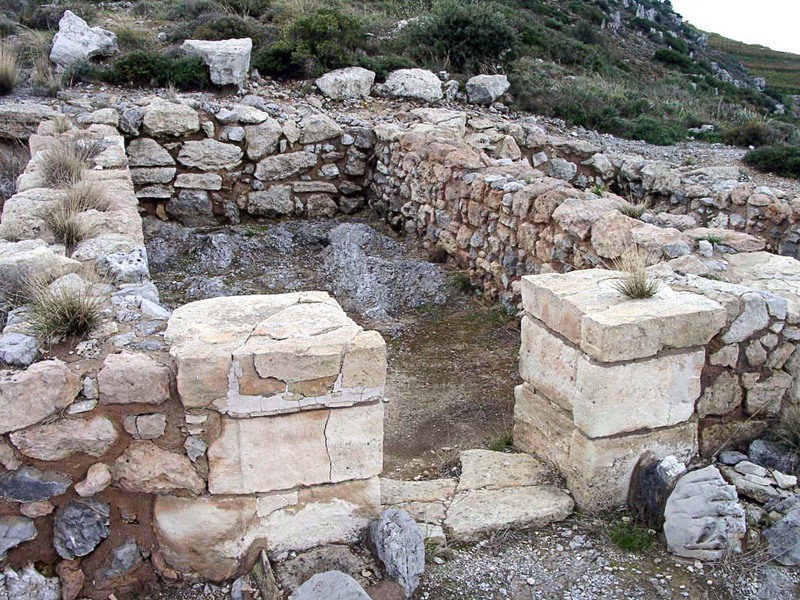 Archaeology tells us the fate of Arxanes followed that of other Minoan palaces. It was destroyed by the huge earthquake in 1700 BCE, but was restored in grand style. Around 1625 BCE the volcanic eruption of Thira caused more damage (earthquake, coastal flooding and ash-fall). This was also repaired and the palace reached its peak in the period 1625-1450 BCE. 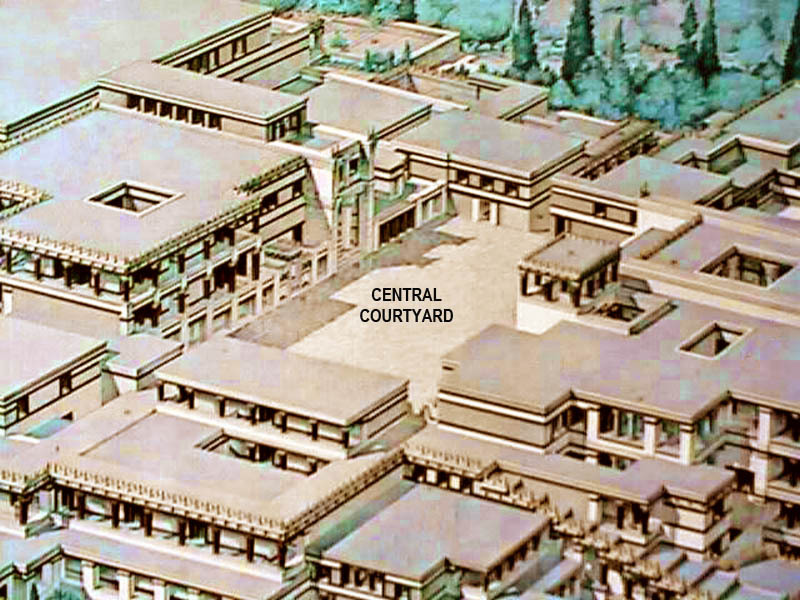 It was then destroyed by some violent cause in 1450 BCE (possibly invasion by mainland Greeks), but was reconstructed (like the palace of Knossos) to serve as a Mycenaean administrative center. 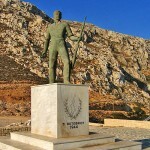 This began a Greek age that lasted about three hundred years, until Dorian invaders conquered the island in 1100 BCE. 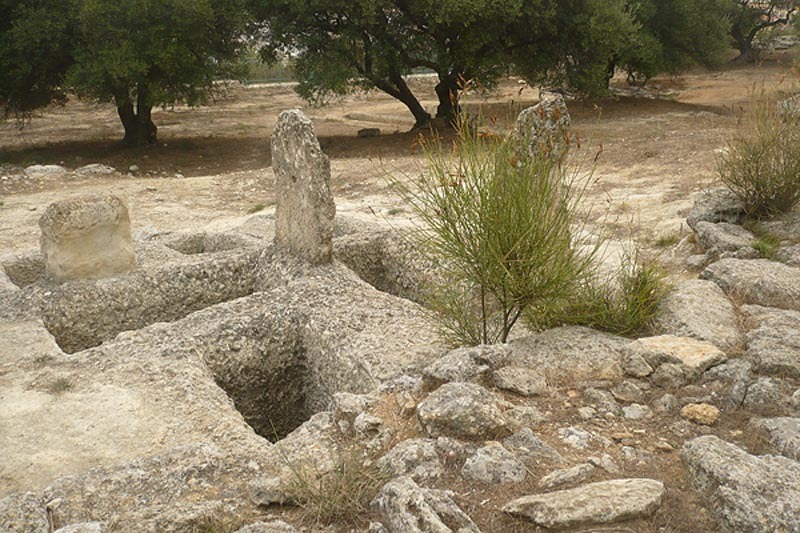 Life in Arxanes has continued uninterrupted from those ancient times until today. Mt. 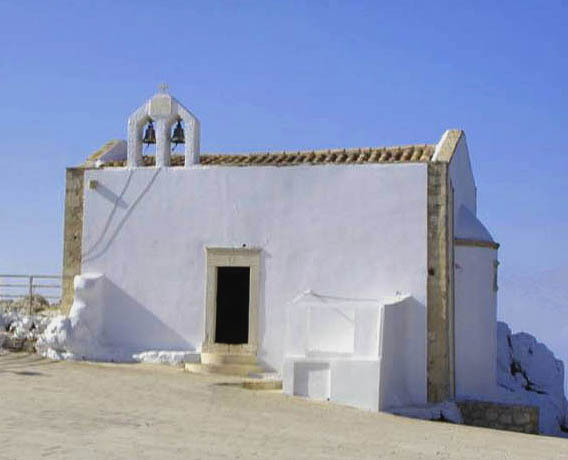 Iouktas remained important in the religious life of local people up to this day – a Greek Orthodox chapel is located not far from the Minoan temple at the top of the mountain. Every year, people from towns below bring flowers in procession to the chapel. 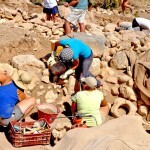 Our thanks again to Ian Swindale (Minoan Crete) for sharing his photos.